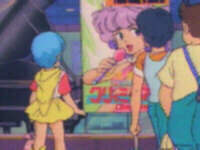 Plot Summary: Two months after Creamy Mami's final concert rumors began to spread that Mami was making a come back, and if that wasn't surprising enough, Tachiban starts a "Big Project" and that seems to have something to do with Mami's come back. As word of Mamis concert reaches the public, Yuu dosen't belive it. Yuu, Megumi, Toshio, Midori, Kidokoro make a plan to get to the bottom of it.